A further offering from Ted Talbot who says that he thinks that this is one of the Carlisle remodelling views, but he is far from sure. This makes an interesting comparison with Plate XVIIb in Brian Reed's Crewe to Carlisle (Ian Allan, 1969). This mystery photo must be taken later than the one in Reed, and from almost the same location. The sleeper marks in the foreground show where the LNWR main line crossed the N&C canal branch - the scene of a fatal accident in July 1870 when a NER goods cut through an LNWR express. 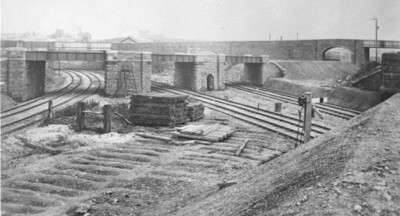 The curving tracks on the left are the NER connection from Newcastle into Citadel. The tracks going diagonally left to front right are the NER tracks to Canal Junction with the LNW line from Upperby to Canal Junction next to them (furthest from the camera). The line on the plate bridges is the LNWR branch to Crown Street goods. The photo is taken from the embankment for the LNWR main line into Citadel (which is behind the photographer), just about at the point where the line became the Citadel Station Joint Committee responsibility (LNW/CR). Before the modifications it passed under the arched bridge and at a lower level - hence the sleeper indentations. Reed does not attribute his photo but when the two, and the others from Ted Talbot, are put together, they may all be from the same set. Both photos are usefully printed on the same page (p36) in Peter W. Robinson's Rail Centres: Carlisle (Ian Allan, 1986). They are given the dates 1876 and 1877 and, together with repros of some of the other Carlisle photos, are credited to Cumbria County Library. Maybe the Library has the full set? St Nicholas Crossing at Carlisle - or the site of - where the infamous crash of July 10th 1870 occurred when an NER empty coal train ran through an up Scotch overnight express - the NER driver was drunk in charge. Yes the same picture as appears in Brian Reed. Again probably circa 1878. The whole set are by Annan of Glasgow, probably taken on two separate occasions. A set of original large prints is in Carlisle Library. Tim Birch's description is excellent. Shows the original level crossing of L&NWR/NER. To the right would have been London Road SB in BR days.